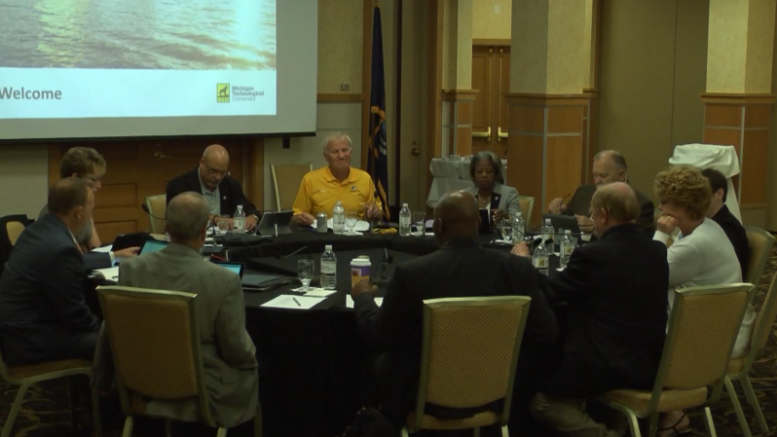 HOUGHTON — The Michigan Tech Board of Trustees met to present updates on the presidential search and numbers from the 2017 fiscal year. Campus is buzzing in honor of Alumni Weekend, but the Board of Directors at Michigan Tech still met to discuss university matters. The Chairman of the Presidential Search Committee Bill Johnson presented an update on replacing current president Glenn Mroz. The committee has selected the firm of Storebeck/Pimentel out of Pennsylvania to carry out the search and hopes begin interviews in early 2018. Johnson said they have already found seven potential candidates for the position. He also said that inclusivity and transparency are key factors in the search process. A Presidential Transition Committee was formed to plan how to best acquaint the successful presidential candidate with the university and it’s key areas of need and interest. The board also discussed financial matters. The Tech Fund saw an increase as well, raising $52.4 million over the fiscal year.